I’ve had fun writing about the Hadwiger-Nelson problem to determine the chromatic number of the plane, but I think this will be my last post on the topic for now! In a comment on my previous post, Will Orrick pointed out that if you tile 3-dimensional space with cubes and color them with seven colors so that each cube is touching six others with all different colors, then take a diagonal slice through that space, you get this! So, we know CNP is either 5, 6, or 7. So which is it? No one is really sure. With some unsolved problems, there is widespread agreement in the mathematical community on what the right answer “should be”, it’s just that no one has managed to prove it. That isn’t the case here at all. If you ask different mathematicians you will probably get different opinions on which number is correct. Some mathematicians even think the “right” answer might depend on which axioms we choose as a foundation of mathematics!—in particular that the answer might change depending on whether you allow the axiom of choice (a topic for another post, perhaps). 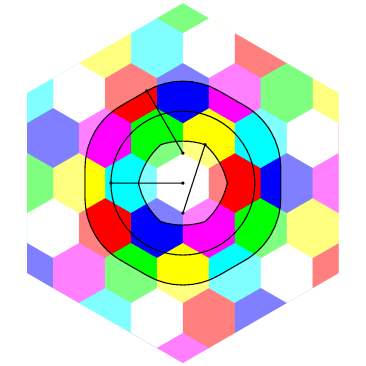 This entry was posted in geometry and tagged bound, chromatic, coloring, hexagons, number, plane, seven, tiling, upper. Bookmark the permalink. Oh, I’m glad you liked the graphic enough to use it as-is. It occurred to me afterwards that using your coloring for the hexes and changing the hue of the highlighted hexes to red or green would be clearer than using the rainbow coloring and changing the saturation, but oh well. Yeah, a semiperiodic 6-coloring of the plane would be super cool, although there has been so much work on semiperiodic tilings that I guess I find it implausible that no one has found one if it exists. Personally I am going to go out on a limb and conjecture that CNP = 7, unless you allow the axiom of choice, in which case CNP = 6, as witnessed by some infinitely detailed Banach-Tarski monstrosity that you cannot hope to visualize. The WP article about this has an oversight that I’m sure I can’t be the first to notice, but you would know better than I. The line at the other end of the spindle can instead be a simplex of n-1, which gives a lower bound of 2n. I don’t think I understand. How would you connect two points with an n-1 simplex? Oh, never mind – there’s nothing forcing you to use the same set of N colors for the glued facet, so the argument doesn’t work. Oh, I see now. I almost believed you. =) But I agree, this ends up only being a more complicated proof that n+2 is a lower bound. Your construction is not n+1 colorable but it is always n+2 colorable.